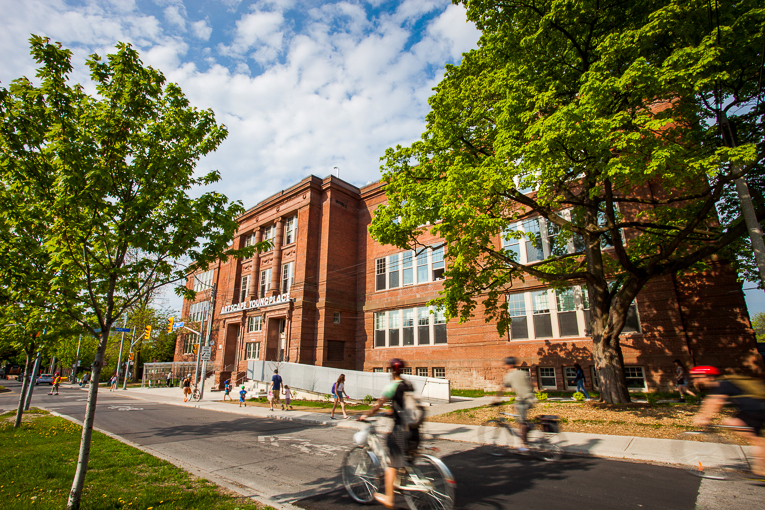 Artscape Youngplace and the Curators’ Network Canada are pleased to announce a newly formed partnership at the historic Shaw Street School site in the Queen West neighbourhood of Toronto, recently redeveloped into a community cultural hub. As both organizations support learning, community and vitality in the arts, Artscape Youngplace and the Curators’ Network Canada look forward to working together to create exciting professional development and exhibition opportunities for Curators’ Network Canada members and Artscape Youngplace Flex Studios members and are pleased to announce a Request for Proposals and an Exhibition Proposal Clinic as its first two collaborative initiatives. Additional opportunities will be announced on an ongoing basis. Find the Request for Proposals and Exhibition Proposal Clinic info after the jump. The Artscape Youngplace & Curators’ Network Partnership is committed to creating opportunities for curators to develop and launch exhibitions in a supportive and dynamic environment. We are currently seeking proposals from Toronto-based curators, working independently or collectively, for exhibitions to be held in the Hallway Galleries at Artscape Youngplace in 2015. The Artscape Youngplace Hallway Galleries is an impressive new public exhibition space, spanning 9,350 sq.ft. of spectacular corridor and stairwell space on three floors. The spaces are ideal for a wide variety of art forms and curatorial projects. The Hallway Galleries are equipped for visual art installation in a variety of media. Hallways are 125’ in length with 14’ ceilings throughout. The three stairwells have multiple landings, niched areas and ample walls stretching to over 28’ in height. Please note that detailed floorplans for the Stairwells are not yet available. For the Artscape Youngplace & Curators’ Network Partnership’s inaugural series of exhibitions, we welcome proposals for exhibitions that relate to ideas and practices embodied by the partnership. They should include works by Toronto-based artists that critically explore concepts around education, innovation, collaboration, labour, and community. Proposals with socially engaged and/or site-specific elements are encouraged. A jury made up of professional curators from both organizations will review proposals and offer feedback on all submissions. As this is a new initiative, the Curators Network Canada will be pursuing project funding through grants, sponsorships, and fundraising efforts. There is no fee to submit or participate, however, curators whose submissions are accepted will be expected to actively participate in these efforts. Expenses related to realizing the exhibitions will be subsidized or offered in-kind through the partnership. Submissions must include the following items. Incomplete submissions will not be considered. Unsure of how to pull together a compelling exhibition proposal? Want to learn how to bring your exhibition concept to life? This clinic offered by the Artscape Youngplace & Curators’ Network Canada Partnership will guide curators through the process of successfully organizing an exhibition from start to finish, with a focus on preparing a submission to our RFP. Curators who plan to submit an exhibition proposal to the partnership are highly encouraged to attend this clinic with a draft outline of their proposal. Representatives from Artscape Youngplace and the Curators’ Network will be present to workshop your exhibition concept, discuss proper formatting of your submission, outline how to develop a financially feasible project budget that includes fair artist and curator fees, and review the logistics involved in realizing your exhibition in the Hallway Galleries. Curators’ Network Canada and Flex Studios Members should RSVP for this Proposal Clinic to ayp@torontoartcape.on.ca to confirm a space in the Clinic. The Curators’ Network Canada is an emerging organization dedicated to supporting the practices of independent curators through networking, expertise sharing, exhibition facilitation, cross promotion, and advocacy. The Curators’ Network is a membership based organization that strives to offer both a sense of community and membership benefits.